If there’s anything I’ve learned about Lakers fans during my time as a sports fan,it’s how overdramatic they are and how big their pipe dreams are at times. 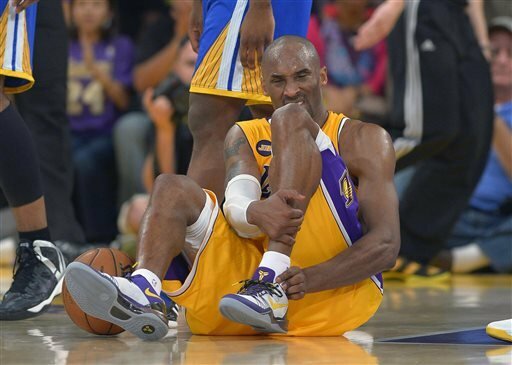 Kobe Bryant’s injury is the latest of that conclusion. Laker fans everywhere are all “praying” for Kobe. Why? Because he got hurt? Laker fans, you’re acting like the guy had gotten into a severe car accident and lost his leg. He hurt his ACL and will be back. And why just Kobe? I didn’t see anyone “praying” for Tom Brady when he got hurt, or Wes Welker, or Buster Posey. Hell,even Derrick Rose didn’t get this sort of attention when his injury came about, and his was much worse than Bryant’s. I’m not here to say I am glad he was hurt,because I’m not. Seeing anyone go down because of injury is horrible to see (unless you get some sort of sick high off of seeing that, then you’re a terrible person). Sure, this injury is just another setback in what has been a disappointing season,but it’s not the end of the world. Also,it’s not the end of the world if the Lakers miss the playoffs. It’s just management’s way of learning that spending money on over-the-hill players in a last gasp to get a ring is not the way to go. As a fan of National League baseball, I’ve always thought that the pitcher should hit. Jayson Stark’s column on ESPN.com suggests that with interleague play taking place every day on the schedule as well as roster construction being tougher than ever before, the designated hitter may come to the National League in the near future. I,for one,am not a fan of this. I’ve always found it something special for the National League that the pitcher hits because he is a part of the team and therefore should be contributing to his team’s (and his own) cause and have a bat in his hands. I understand that this to an extent has hurt the NL with a lot of their big time sluggers jumping to the AL to become designated hitters, but I don’t care. It’s what I have loved about baseball, especially the National League, and it’s part of the charm of the NL. I like seeing guys like Jonathan Sanchez get a triple in the final game of the season. I like seeing Barry Zito get a 2-RBI day. Sure,these guys aren’t the best hitters, but seeing the pitcher hit makes the game fun for me and a lot of other fans who enjoy baseball and are fans of National League teams. That thrill would surely be gone. I know that, inevitably, the DH may come to the NL, but I admit, it’s going to be quite weird to get used to. 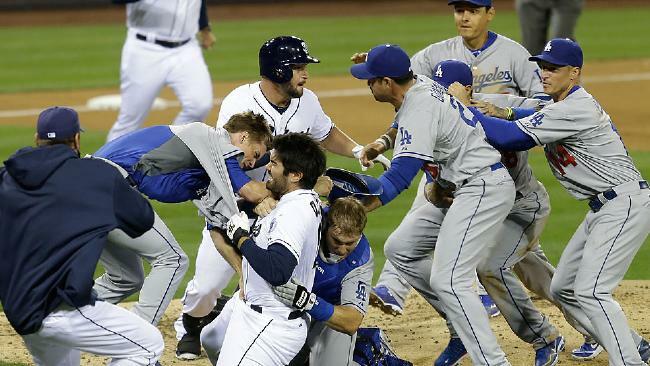 I’d be remissed if I didn’t mention the brawl between Zack Greinke and Carlos Quentin that took place on Thursday night. I gotta say that it was an awesome brawl. It was awful that Greinke got hurt, but he asked for it. Greinke plunked him before and did it again and after he did it again, he barked at Quentin and it was on. Not only that,but he lowered his shoulder trying to tackle Quentin and he’s a big guy. No wonder he’s out six to eight weeks. I’ve heard from Don Mattingly and other people that Quentin should be out as long as Greinke is and I wholeheartedly disagree. Injuries are part of the game and unfortunately,Greinke got his. Not only that,but what if Greinke’s recovery takes longer than expected? Is that fair to Quentin? I don’t think so. I think a punishment of eight games missed will suffice. No more,no less. And where the hell was A.J. Ellis? As catcher, he is supposed to be the mediator to prevent Quentin from coming after Greinke in the first place. Some catcher you are,pal! One saga that’s playing out locally is the Sacramento Kings and their fate. Early in the week, Ron Burkle, a major investor in the team, had to back out due to conflicting interests. Chris Kelly, a former candidate for Attorney General in 2010 and the former Chief Privacy Officer for Facebook, has replaced Burkle as a primary investor. Friday, the group trying to buy the team bought into the Maloofs ultimatum and matched Seattle’s offer of $525 million only to have the Seattle group up the ante and put up a counter offer $550 million. I didn’t think this bidding war for a team that as of press time has only won 28 games this year, but it has. Nobody knows what will happen this week as far as the league’s decision,but I know a lot of fans in Sacramento and Seattle will be on the edge of their seat to find out. Keep reading my blog for any details as well. This blog is about to hit 50,000 views any day now and I couldn’t be more thankful. I know it doesn’t seem like it is that many,but for someone who isn’t famous,I’d say that’s pretty good. I hope everyone continues to keep reading and I hope to provide stuff that you’ll enjoy.